Come learn the basics of organic gardening, from building healthy soil, to proper watering, to managing weeds, insects, and diseases in environmentally-friendly ways. Learn to work with nature to grow tasty and nutritious vegetables. The class will be held at the Walkertown Library Branch located at 2969 Main St, Walkertown, NC 27051 from 6:00 p.m. until 8:00 p.m. The class is free but registration is required for handouts. Please register online at: https://tinyurl.com/Spring2018VegWorkshops or call 336-703-2850. For Spanish interpretation or child care, please call 336-705-8823 at least two weeks before the event. Faculty and staff volunteers weed around crops at the Agroecology Education Farm during a volunteer work day. 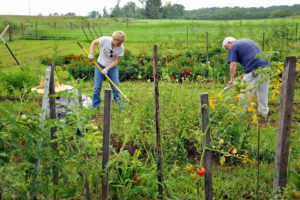 Organic practices in the garden involve correct timing of garden chores to build and protect soil fertility, the selection and planting of the best garden varieties for our climate, proper management of weeds and insects, as well as proper watering techniques. Pest management will be highlighted in this presentation. If weather permits, participants will be led in an insect scouting activity as part of an Integrated Pest Management strategy.